Preparing to run a solid waste survey at a modern house east of the OSC campus. Taking a preliminary observation-based walk to assess the study area. Compiling, processing and graphing the data. Three storied house with owners and OSC students. This is a new house with concrete slab roof. Single storied, tile-roofed home in the shadow of taller commercial buildings to the west of the OSC campus. A study in contrasts in homes near to the school. Screen grab showing Survey 123 raw data and map area. As a part of the project the class worked with a variety of maps to get a sense of their study area. 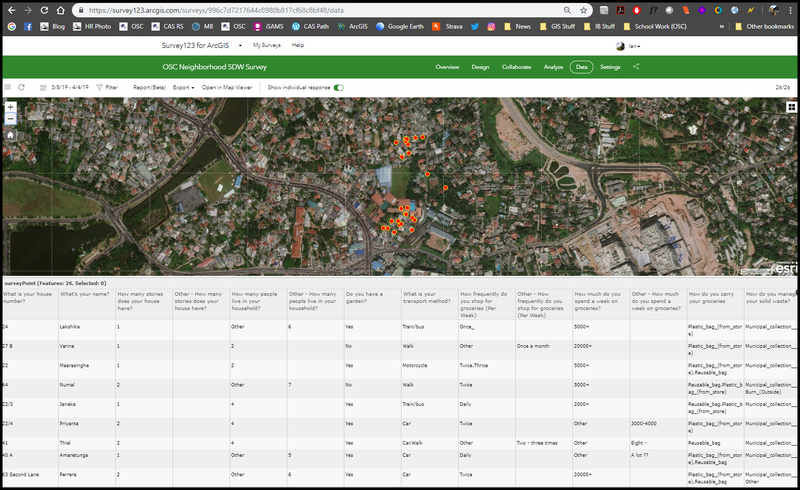 OpenStreetMap is a great source but most of the building have not yet been mapped. Previous classes of OSC students have mapped the school campus but the Class of 2020 worked to expand the area. The maps below show the progress that they made on this ongoing project. OpenStreetMap of the OSC area showing previous edits. OpenStreetMap of the OSC area after the DP Geography students worked on adding houses from our neighborhood. Typical middle class two-storied home near to the northern OSC boundary wall. Conducting an interview in a small commercial operation in a residential house. Meeting the neighbors on the other side of the OSC auditorium. Learning about solid wate patterns in a 30 + year old house near the auditorium. 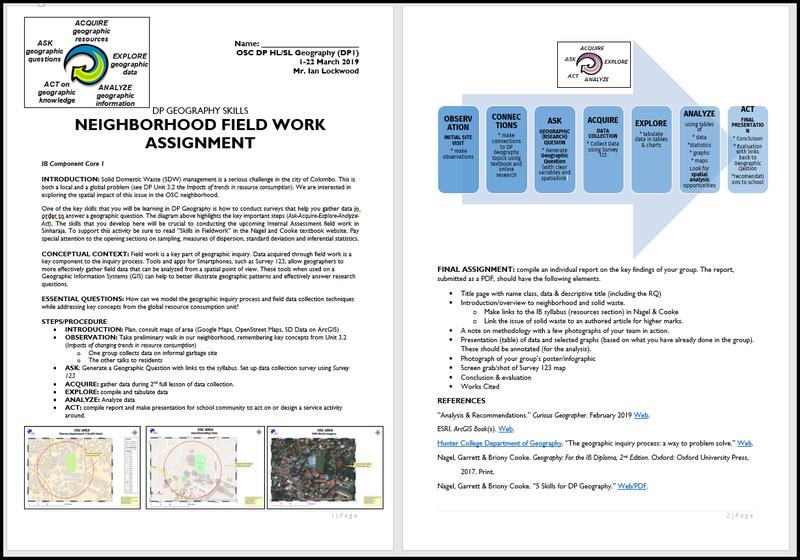 The field study was completed after two blocks of data collection in the OSC neighborhood. Together the class was able to survey 26 different households near to the OSC campus. We have a much better sense of of our neighborhood though it would be good to continue the study and get more houses surveyed. There were a few conclusions. Most residents are getting some sort of municipal solid waste pick up. 23 of 26 respondents(86.5%). Respondents mostly appeared satisfied with this arrangement abut several remembered times when the collection system had broken down in the past 2-3 years. 23 of the 27 (92.3%) respondents are separating waste. This makes sense as it is now required by the municipality. A few residents stated that they did weekly burns of leaves and paper. (3 of 26 or 11.5% households surveyed). However it seems, based on observation, that other items (Tetrapacks, plastic bits) are being mixed in with these burn piles. Only a few households were composting (3 of 26 or 11.5% households surveyed). “Analysis & Recommendations.” Curious Geographer. February 2019 Web. Hunter College Department of Geography. “The geographic inquiry process: a way to problem solve.” Web. Nagel, Garrett & Briony Cooke. Geography: For the IB Diploma, 2nd Edition. Oxford: Oxford University Press, Print. Nagel, Garrett & Briony Cooke. “5 Skills for DP Geography.” Web/PDF. OSC’s Biogas unit being installed by the school’s maintenance team behind the science labs in October 2018. Solid domestic waste (SDW) continues to be a pressing issue at different scales here in Sri Lanka. The problem of managing solid waste on OSC’s campus challenges our community as it does the city and country. Earlier this semester we took small steps to address the issue of managing the campus’ biodegradable food waste using a biogas plant. The approach of OSC’s Recycling and Sustainability service group is to work hard to reduce and recycle what the school community is discarding. Our group’s mission, of course, is to reduce the school’s ecological footprint. We know from informal studies that more than half of our SWD is organic and can be composted if we have the right infrastructure in place. About 10 years ago we experimented with compost on campus but poor maintenance, oversight and the design of the concrete bins contributed to a lack of success with this will intended initiative. Since then our organic waste has been being picked up by municipal workers. This is a less than perfect situation as the wet waste it is often mixed with recyclables and other waste contributing to a foul smell at the garbage depot near the school entrance. The idea of installing a biogas plant to deal with campus organic waste was rooted in developments in household biogas plants by the plastic manufacturer Arpico and a MYP exhibition project in 2014. The exhibition was a student exploration of alternatives with leadership provided by Tassy Dalhan in the Grade 5 team. It took a while, but the ideas have finally resulted in concrete action. A year ago Class of 2020 student Disara Samayawardhena researched biogas plants and made a model unit for her MYP Personal Project. 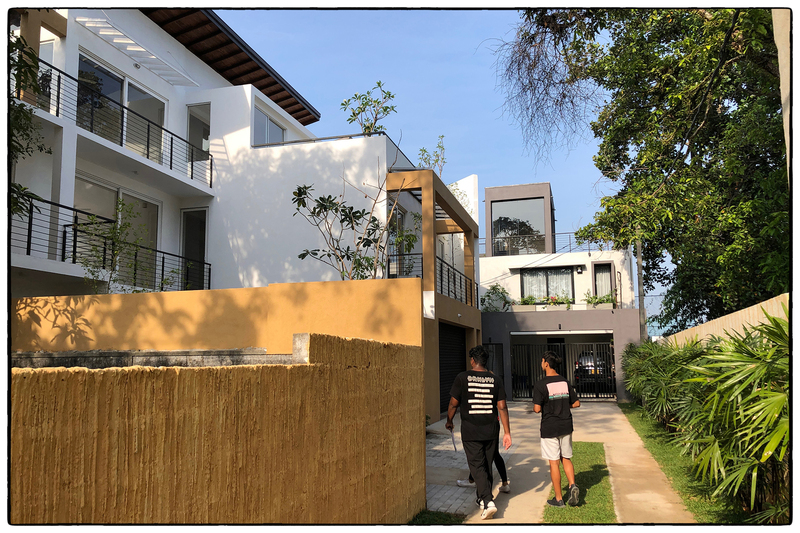 In May 2018 Disara, Mr Cirshanta Fernando the campus administrator and I visited the household plant designed and owned by Sunil Weilvata, an employee of the National Engineering Research and Development Centre of Sri Lanka (NERDC). We were impressed by what we saw and it was Sunil’s unit that formed the basis for our plan. 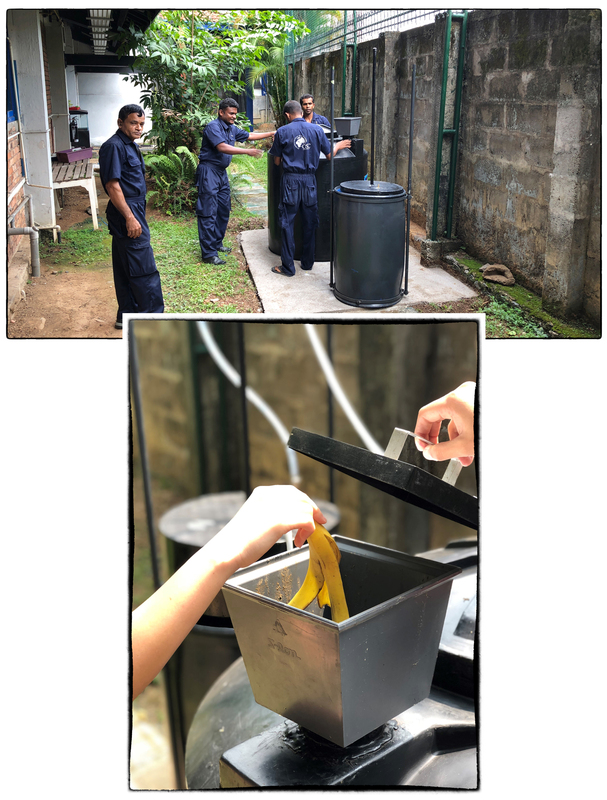 At the end of the school year the R&S Service group committed funds (from our years of paper recycling earnings) to the biogas project and the school made up the small difference of the LKR 70,000 unit. Inspecting Sunil Weilvata’s householf biogas unit in May 2018. Biogas being used to cook at Sunil’s home. Slurry that Sunil uses to fertilize a hydroponic garden on his rooftop. Feeding food waste into the digester. View of Sunil’s biogas plant showing the different parts of the unit. Over the summer Sunil worked on the unit and it was delivered and installed behind the science labs in early October 2018. At the moment, we are charging it with daily inputs of cow dung and it will soon be ready to start taking organic waste from the cafeteria. 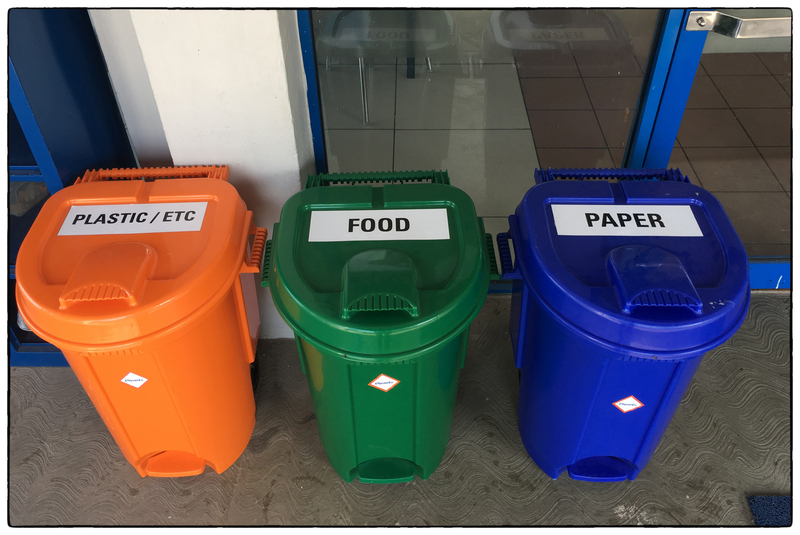 To better manage and reduce the wet (food) waste on the OSC campus. To produce renewable CH4 to use as a fuel source (for demonstration cooking). The system needs careful weekly, if not daily, monitoring. We need to be able to measure inputs and outputs from the system using weigh scales and gas pressure gauges. At the moment, these systems are not in place. We need the school community to do a better job with separating waste in the canteen. At the moment plastic, tinfoil and other non-biodegradables are showing up in our food bins. Attanayake, Dimuthu. “How to dump the trash.” Sunday Observer. 10 June 2018. Web. Daniel, Shannine. “Meethotamulla: One Year On.” Roar. 2 May 2018. Web. Environmental Impact Assessment Report of the Proposed Project on Metro Colombo Solid Waste Management project Final Report. Ministry of Urban Development, Water Supply and Drainage. Colombo, 2015. Web. “Garbage projects coming on stream to help ease disposal issues.” Sunday Times. 5 August 2018. Web. “Solid Waste Management: A Way Forward.” Daily Financial Times (FT). 25 July 2017. Web. “Status of Waste Management in Sri Lanka.” Environment Foundation Ltd. (EFL).14 June 2017. Web. The Metro Colombo Solid Waste Management Project. Ministry of Megapolis and Western Development. Central Environment Authority. 2017.Web. Wipulasena, Aanya. “Despite EIA report and protests: Govt ploughs through Aruwakkalu landfill project.” Sunday Observer. 10 October 2018. Web. Meethotamulla dump site after the landslide and tragedy. Image courtesy of the Sri Lanka Air Force. 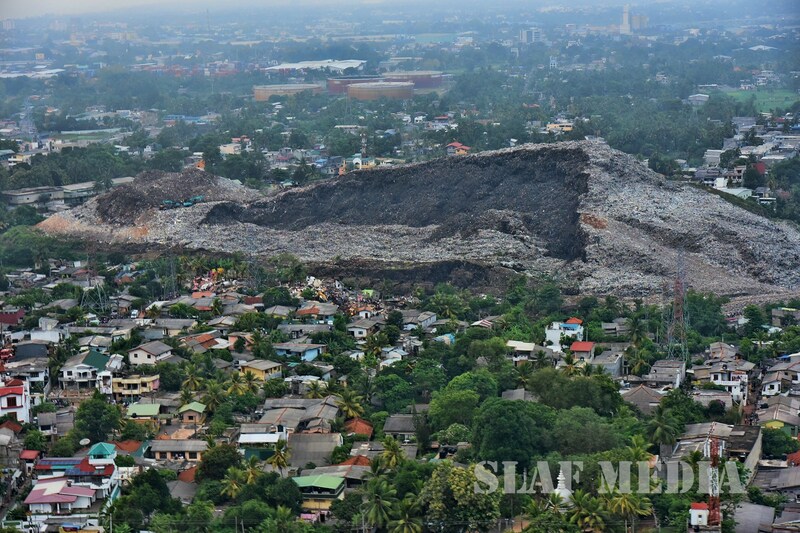 A week ago disaster and tragedy struck Colombo’s Meethotamulla garbage dump. The images and stories depict a heartbreaking chronicle of poor management, environmental neglect and human misery. Thus far, the press has been busy pointing fingers at various government agencies and political parties for blame of the disaster. The more difficult truth is that all of us are culpable in the problem that led to the disaster at Meethotamulla. The root problem is our high-consumption lifestyle and the solid waste that it generates. The amount of waste is significant but it is largely out of sight to most of us. Meethotamulla has provided a painful wakeup call. There are now efforts underway in our community to assist families affected by the collapse of the garbage dump. These are important initiatives but the tragedy provides a broader teachable moment where each one of us can do something to address the root problem that led to the landslide. All of us are consumers and our waste, whether at home or at work, is collected and has been added to the mountain of rubbish at Meethotamulla. To get a sense for our school’s waste generation walk up the gym approach road and note the smell and sometimes overflowing numbers of black garbage bags. We send an average of two wagon load of solid waste off campus every week. I suggest that an appropriate response to the tragedy is to look for ways that we can reduce the amount of solid waste that we produce at school and at home. In the following section I include some suggestions that are based on personal experience and experiments to reduce my own ecological footprint at school and at home. At OSC we have had an ongoing campaign get the canteen to use washable plates and silverware. The initiative started with the Recycling & Sustainability (Train to Sustain) service group but was taken up by Reefkeepers and eventually the Canteen Committee. The initiative took several years of active lobbying but the changeover in December 2016 has made a difference in reducing solid waste. There is still, however, work to be done. The canteen is still selling juice in disposable cups with plastic lids and straws. We need to move on eliminating all the plastics and using washable cups. Thus far, we are not composting any kitchen or garden waste produced by OSC. In 2015 a Grade 5 class exhibition group investigated the idea of using a biodigester to deal with kitchen and garden waste. The R&S group agreed to fund it with money from recycled paper sales but that proposal has not been given sanction from the school. Waste separation is an area that each one of us on campus can do a better job with. The feedback from the maintenance crew is that the OSC community is not separating items in the three categories of bins. This makes it hard for the garbage collectors to separate, recycle and thus reduce the amount going to the landfill. Follow the three Rs (Reduce Reuse Recycle). Reduce what you consume and make every effort to not take or buy disposable items like plastic bags. When you shop, use reusable shopping bags. There are even reusable mesh bags for vegetables that have been pioneered in our community by Rachel Jackson, Clover Hicks and Raina Lockwood. Reefkeepers will be selling these shortly. These efforts reduce the amount of single use plastic that you take home. Check out Rice and Carry’s innovative ways of reusing rice bags to help reduce disposable shopping bags. Separate your waste at home. This is probably the single best thing that you can do. Wet waste from the kitchen can be composted. A study that I did of my home suggests that roughly 50% or more of household waste is wet waste and mostly compostable. Household composting is a viable option for most of us with gardens and, if managed correctly, will lead to reduction in solid waste and smelly garbage bags. We have the facility to recycle cardboard and paper and PET plastic here at school and you are welcome to bring in items to us. We ask that any plastic bottles are cleaned. For parents and teachers, the R&S group can provide guidance on where to go to sell your paper and cardboard if you have large volumes. This waste actually pays and the R&S groups has built up a capital fund thanks to paper and cardboard sales over the past 12 years. We collect hazardous and E-waste items such as batteries and printer cartridges. We are working with Dialog to give these items to them or recycling. The Orange lighting company takes back CFLs bulbs. Thus don’t mix these into regular garbage bags. Meethotamulla was an unnecessary human-made tragedy but we can learn from the experience and do a better job so that we do not contribute to a future solid waste disaster. Bresnick, Sam. “Lessons from the World.” Daily News. 18 April 2017. Web. Kotelawala, Himal. “Sri Lanka Death Toll Rises in Garbage Dump Collapse.” New York Times. 17 April 2017. Web. “Meethotamulla tragedy.” Daily Mirror. 18 April 2017. Web. Wipulasena, Aanya. “Authorities’ promises stink as much as garbage mountain.” Daily Mirror. 6 July 2014. Web.